Finalists from the Broadcom MASTERS middle school science and engineering competition have the opportunity to meet finalists from ISEF. This is why Henry Samueli, Broadcom’s founder (whose passion for electrical engineering grew out of building a shortwave radio in 7th grade) and Scott McGregor (Broadcom’s former CEO who used the family basement to make model rockets as a kid) voted in 2010 for the Broadcom Foundation to help develop ISEF’s “farm team” by sponsoring the Society’s middle school competition, the Broadcom MASTERS. 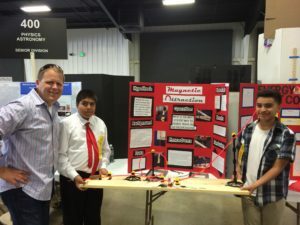 Two students compete in the Orange County Science and Engineering Fair that worked on their project after school, a program supported by THINK Together and the Broadcom Foundation. 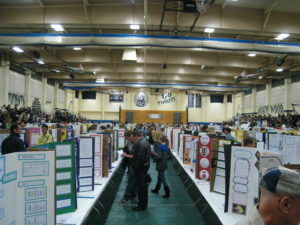 The science fair experience is simply different than other competitions. Although there are many wonderful tech-oriented competitions and maker programs that help generate a specific talent pipeline for employee-thirsty tech companies like Intel, they do not – cannot – reach all the young people we need for hundreds of thousands of STEM jobs in the U.S. or the millions needed around our interconnected globe. Just wander down the rows and rows of projects one sees at the Intel International Science Fair in Los Angeles this May to experience the amazing science and engineering research of 1600+ world class high school students from every state and 78 countries who are fusing into exciting new areas of exploration that test the outer limits of imagination, and you gain appreciation for the important of this august competition. The Society for Science and the Public has cultivated the most powerful STEM talent pipeline the world has ever known through science fairs. The Broadcom Foundation has just doubled-down on science fair sponsorship with an additional six-year, multi-million dollar pledge to sponsor Broadcom MASTERS, and Regeneron has come aboard as the new standard bearer of the Science Talent Search. I am already excited to welcome the next visionary sponsor who takes up the reins of the International Science and Engineering Fair in 2019.